Visage Imaging is excited to announce new career opportunities working virtually, at our new San Diego headquarters, or at our European headquarters in Berlin, Germany. Visage 7 delivers amazingly fast server-side rendered images streamed via an intelligent thin-client viewer. Visage Imaging customers around the globe use the Visage 7 Enterprise Imaging Platform to leapfrog the limitations and restrictions of legacy PACS, significantly improving patient care through the use of innovative server-side technology. We pride ourselves on our distinctive, impactful technology and services, and strive for excellence in everything we do. Visage Imaging, Inc. and Visage Imaging GmbH are wholly-owned subsidiaries of Pro Medicus Limited (ASX: PME), with more than 30 years of experience in medical imaging. All interested and qualified candidates are requested to email a resume and cover letter to jobs@visageimaging.com. Visage Imaging, Inc. is looking for Applications Engineers, preferably in or near the San Diego area, to implement and support the industry’s fastest, most powerful Enterprise Imaging Platform: Visage 7. The Visage Imaging Applications Engineer will be responsible for installing and performing initial configuration of Visage 7 software, implementing solutions at customer sites, as well as providing IT training and ongoing customer support to healthcare institutions in North America. Have Microsoft Windows Server, Microsoft SQL Server, OpenSuSE Linux, and networking skills sufficient to install and support Visage Imaging products, both remotely and at customer facilities. Have understanding of the overall healthcare IT standards relevant to each project, specifically but not limited to IHE, DICOM, HL7 and HIPAA. Work with the Visage Customer Service team to define and document detailed system requirements. Present technical status updates to the Project Team. Be responsible for installation and configuration of Visage Imaging products, both remotely and at customer facilities. Configure DICOM and HL7 interfaces, and integrations with 3rd Party Products. Train, both remotely and at customer facilities, customers’ support resources on the use and support of Visage Imaging products. Either already have or be willing to obtain a U.S. Government security clearance. Preferred, 5+ years healthcare informatics, or related experience. Less experience will be considered for the right candidate. Degree in a technical or scientific subject or equivalent qualification. Experience in one or more of the following areas: Administration Linux, Windows Server, SQL Server, networks, DICOM / HL7, medical imaging, software development, scripting languages (perl, php, bash, …). Full-time, at our San Diego headquarters. Virtual placement will be considered for the right candidate. Visage Imaging, Inc. is looking for an Applications Specialist, working virtually or at Visage Imaging’s US Headquarters in San Diego, CA, with the industry’s fastest, most powerful Enterprise Imaging Platform: Visage 7. The Visage Imaging Applications Specialist will be responsible for providing pre-sales demonstrations, post-sales training to customers, and remote customer support. Use screen-sharing technologies to remotely demonstrate Visage Imaging products to prospective customers, as well as participate in onsite pre-sales demonstrations and tradeshows. Document demonstrations and provide reports to the Visage Imaging management team. Perform training both remotely and at customer facilities, in both group and one-on-one situations, including the use of all clinical workflows supported by the Visage Imaging software as intended in each Project Scope of Work. Document each participant of any training session and produce participation reports for the Visage Imaging Project Manager. 5-10+ years clinical and healthcare informatics experience. Visage 7 experience preferred. 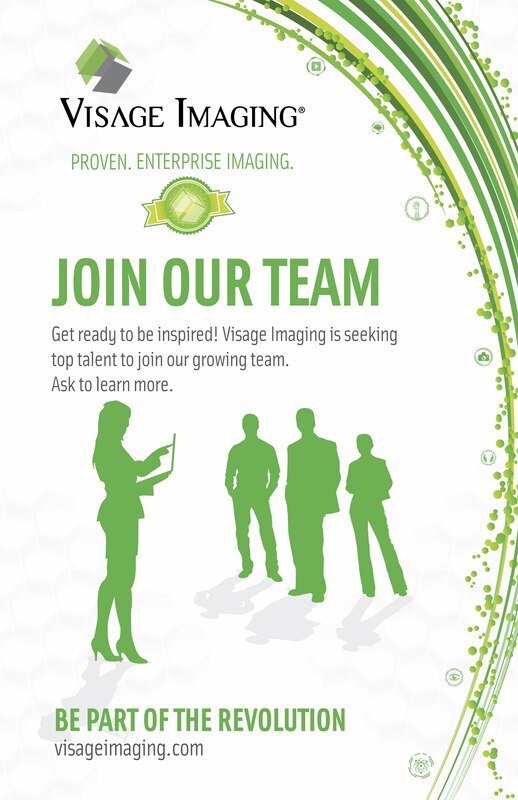 Full-time, virtually or at Visage Imaging’s US headquarters based in San Diego, CA. Visage Imaging GmbH is based in Berlin, Germany and is where the Product Development and Global Customer Service teams are based. At the European headquarters, Visage Imaging GmbH is looking for Applications Engineers. The Visage Imaging Applications Engineer will be a part of the Global Customer Service team, and will be responsible for installing and performing initial configuration of Visage 7 software, implementing solutions at customer sites, as well as providing IT training and ongoing customer support to healthcare institutions around the world. 5+ years healthcare informatics, or related experience. Less experience will be considered for the right candidate. Good command of the English language, both written and verbal. German language is desired. Other languages are a plus. Full-time or part-time, at our Berlin headquarters. Visage Imaging GmbH is based in Berlin, Germany and is where the Visage 7 R&D and Product Management teams are based. At the European headquarters, Visage Imaging GmbH is looking for Software Developers. As a Software Developer at Visage Imaging, you will have responsibilities in software design, technical specification, coding, and testing of the Visage 7 product line. Is a part of our highly qualified development team and will develop advanced functionality for our client-server PACS product line. Develops workflow components, scalable and stable interfaces and intuitive user interfaces. Tackles interesting technical challenges using modern technologies. Will be involved in specification and implementation of the software components in an agile software development environment. Multiple years of experience in software development. Very good knowledge of C ++. Knowledge and experience in one or more of the following areas is a plus: Qt, SQL Server, .NET / C #, DICOM / HL7. Good command of English and German languages, both written and verbal. Other languages are a plus. Equivalent education as Diploma / Bachelor / Masters / PhD or similar in computer science, physics, mathematics, electrical engineering. Thank you for your interest in Visage Imaging!